Revised Model Goods and Services Tax (“GST”) Law [“MGL”], put on public domain on November 26,2016, which reflects seeming efforts put in by the Government to look into the voluminous suggestions submitted by various stakeholders, on First Model GST Law (put on public domain on June 14, 2016), is indeed laudable. This Article deciphers the provisions under Revised MGL, in a lucid manner for easy understanding. 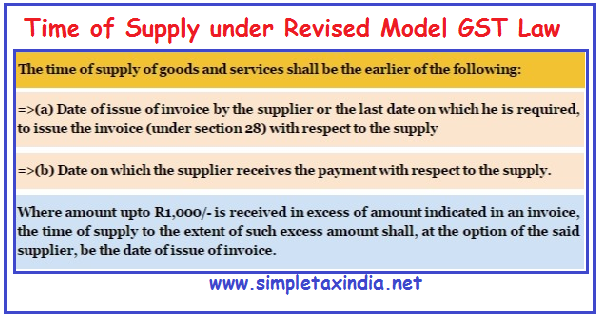 =>(b) Date on which the supplier receives the payment with respect to the supply. Where amount upto R1,000/- is received in excess of amount indicated in an invoice, the time of supply to the extent of such excess amount shall, at the option of the said supplier, be the date of issue of invoice. Where the supplier of service is located outside India, the time of supply shall be the date of entry in the books of account of the recipient or the date of payment, whichever is earlier. (b) Date of redemption of voucher, in all other cases. Date of receipt of payment. Thus, the rate of tax would be the one prevailing when two out of three events occur either prior to or after the date of change in rate of tax. Manifestly, it seems that most provisions are borrowed from the present POTR under the Service tax laws, with some modifications. In the Revised MGL, number of parameters as provided in the First MGL has been pruned down and events such as date of receipt of supply in the books of account of recipient etc., have been removed. In First MGL, provisions in respect of change in rate of tax was restricted for supply of services only, which now has been extended for supply of goods as well. However, still no provision is provided in the Revised MGL to determine the time of supply where goods or services becomes taxable for the first time under GST regime as provided under section 67A of the Finance Act, 1994 read with rule 5 of the POTR.